I got all three Memebox Scentboxes when they offered a buy 2 get one 1 free Value Pack. These boxes were $15 plus shipping. 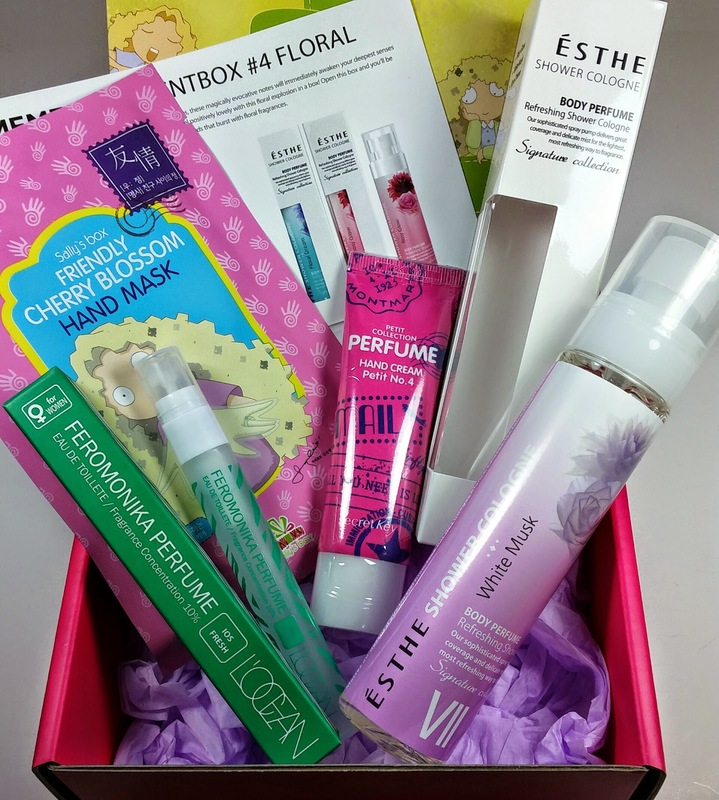 This review is for the Floral box! Initially, I had not wanted the Floral box because I don't really care for flowery scents so I considered it my "free" box. Now that I have them all, that has changed. The Floral Scentbox came in a smaller Memebox than usual. It's the same size used for the Memebox Minis. This box has four items in it. Considering the description said there would only be three items per box, I'm glad there are four and one of them is pretty cute! Sally's Box Friendly Cherry Blossom Hand Mask x1- This is a glove hand mask with cherry blossom extracts and shea butter. It also has coconut oil and grapefruit extract. This came with a little Sally's brochure and that makes me think we might start seeing more of this brand. 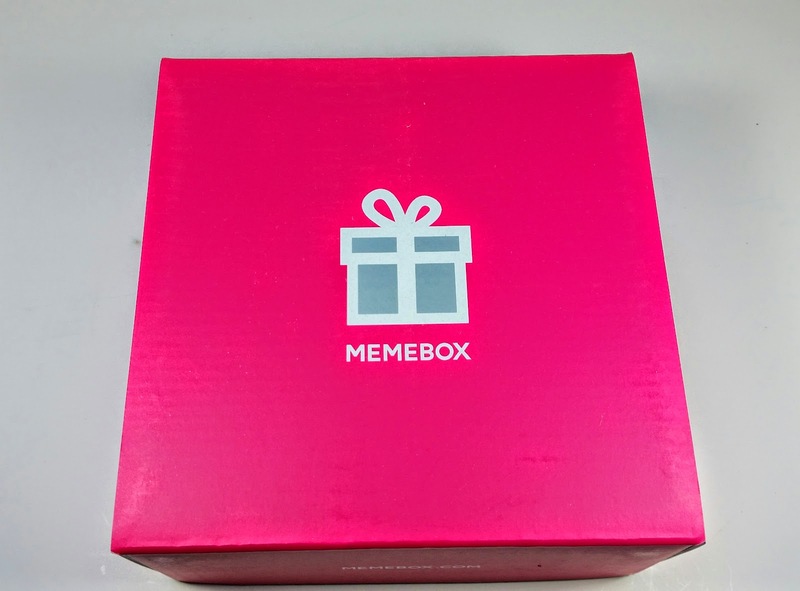 A new partnership for Memebox? I hope so! L'Ocean Feromonika Perfume-10ml- This is an eau d' toilette and is a purse size spray. This is called IOS Fresh. It's a knock off of something high-end but I don't know which. It also has L-Muscone in it. L-Muscone is a synthetic musk/pheromone. Apparently, it's supposed to make you irresistible to deer. Or other humans. Whatever. It smells good! 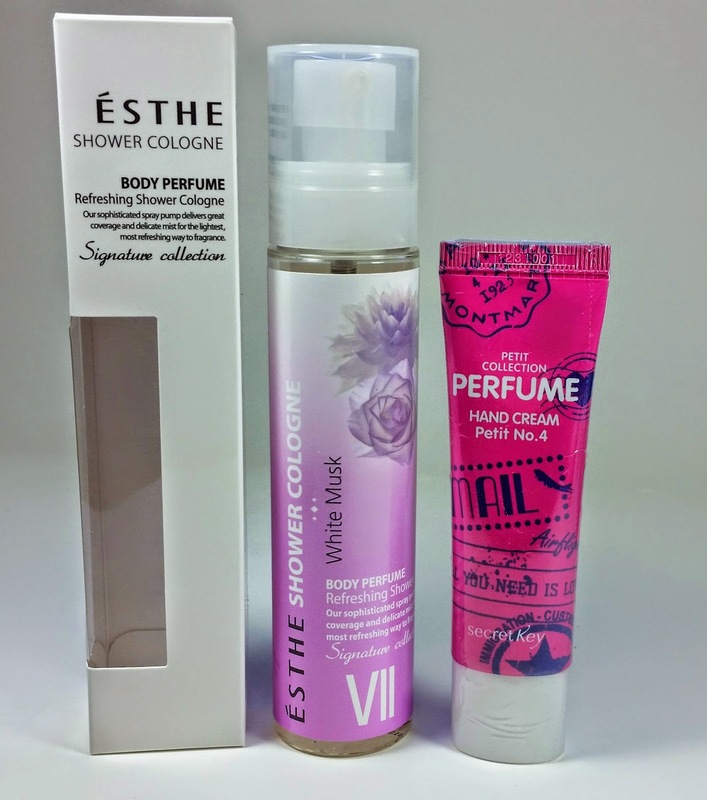 Esthe Shower Cologne-100ml- This is a fine spraying body perfume that I got in the White Musk scent. I love it. I really like that old drugstore perfume called Jovan White Musk. This smells like that and its heavenly! The other two scents are Rosy Glow and Floral Dream. Secret Key Perfume Hand Cream-30g- I will never complain about seeing Secret Key in a Memebox. I love this brand and have been so happy with the skincare products I've used by them. This is a hand cream with a double dose of perfume. There are six fragrances. Mine is pink and says No. 4 on it. No. 4 is Bergamot Peach Rose! It's made with shea butter and it's not super thick and goes on in a way that makes me think there's hyaluonic acid in it, which is good. It has a top note of bergamot with a slight peachiness but it definitely fades down to rose. I don't particularly like rose. Thank you very much for listing the Secret Key scents, I had been looking for that information. I don't think this was a great box over all - two perfumes and two hand moisturisers is too much, I would've preferred more variety in there. But at least we all smell good and flowery now!